Lacy J Dalton is a country classic. People Magazine called her the country equivalent of Bonnie Raitt. Born in Bloomsburg, Pennsylvania, raised in a family of musicians, she heard the call of California in the late 1960s, found her way to Santa Cruz, and played in a psychedelic rock band called Office. From there, it was on to Nashville, where she turned out a string of hits like “Black Coffee,” “Everybody Makes Mistakes,” “Crazy Blue Eyes,” and “Hillbilly Girl with the Blues.” Billboard Magazine named her signature song, “16th Avenue,” one of the Top 100 Country Songs of all time. The Academy of Country Music voted her Best New Female Artist in 1979, and since then she’s earned numerous Grammy nominations and won three Bammies for Best Country-Folk Recording. 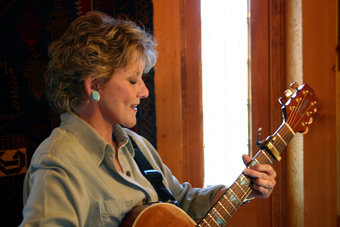 Lacy has released 23 albums during her career, including her latest, Here’s to Hank, which the website Roughstock describes as “a great singer paying homage to a country legend.” Her versions of Hank Williams’ classics linger in the mind with their straightforward arrangements and the pure conviction of her singing. She’s performed duets with a host of country’s finest, including Bobby Bare, Glen Campbell, David Allen Coe, Merle Haggard, George Jones, Willie Nelson, and Eddie Rabbitt. Tonight she’ll be joined by Reno’s Dale Poune on guitar, mandolin, and harmony vocals.